ABC has a reality program called Shark Tank. I’ve never seen it. Apparently, the idea is that, if you have an idea for a business, you can pitch it to the show, and if the producers feel it has merit, they’ll bring you on and you can pitch the idea to a team of “sharks,” or hard-hitting business tycoons who will decide whether to fund your company. The season premiere is this Friday, September 25, and it features the McClary Bros. line of drinking vinegars. I’ve had their shrubs, and I’m excited to see that shrubs will get some prime-time attention. I also have a mercenary motivation for this post. I want people to search online for “Shark Tank” and “drinking vinegars” or “shrubs” or “McClary” and find this page. I want them to click this link: Buy My Books. And then I want them to buy my book. It’s a simple idea, really. Can you blame me? Hey, I got a last-minute invitation to appear on tonight’s installment of Fuhmentaboudit, on the Heritage Radio Network. It’s easy to “tune in” and listen, so I hope you’ll check it out, either live or via podcast. Mr. Cowdery’s reticence is understandable; he writes whiskey books, and he wants to maintain his comfortable lifestyle. I don’t know if I’d go so far as Cowdery. I’ve read some damn fine whiskey books in my years as a tippler, and I’d recommend them all. But I will say this much: this is the book you want and need if you’re just starting out in whiskey. 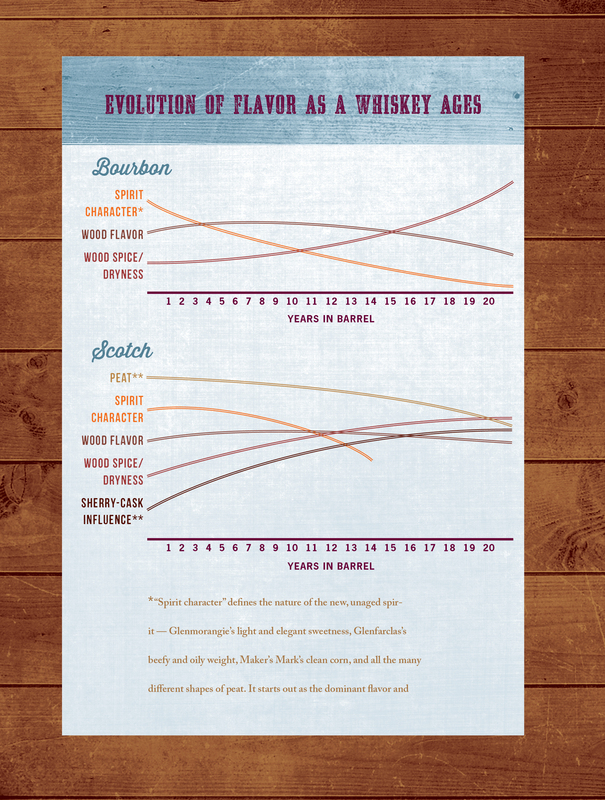 Bryson maps the major styles of whiskey, from bourbon to rye to Canadian, from Irish to Scotch to Japanese, and from craft to the various world whiskeys (that is, from growing markets such as India and Taiwan). He describes what sets the various styles apart from one another; so, for example, he details the grains that are in each style, the barrels it’s aged in, the climates and warehouses that hold it, and the length of time its aged. Scotch, for example, is made primarily or exclusively from malted barley; it’s aged in used barrels (normally bourbon, but with some sherry and other wine casks tossed in for additional flavor); it ages in a cooler climate that enables longer aging; and it can age for up to 30 years or more without getting too woody. Bourbon, conversely, is made primarily from corn, with other grains in the mix to add accent flavors; it ages in new oak barrels that impart more woodiness than do scotch’s used barrels; it ages in a warmer climate that ages it more rapidly than Scotland’s cooler climate; and therefore, it usually reaches its peak at roughly 10-12 years. Each individual style is different, and Bryson masterfully explains how those differences affect the flavors of the finished product. Every whiskey drinker starts somewhere. I started with bourbon and moved to scotch and then rye and on to other styles. When I started drinking scotch, I couldn’t begin to understand what made it unique until I started reading books that helped me puzzle it all out. Tasting Whiskey is such a book. Its other strength is the infographics the book uses to illustrate some rather complicated concepts. I write about whiskey, and so I know that it’s not always easy to describe, in words, the effects of barrel aging, or how barrel placement in a warehouse affects how quickly or slowly the whiskey ages. 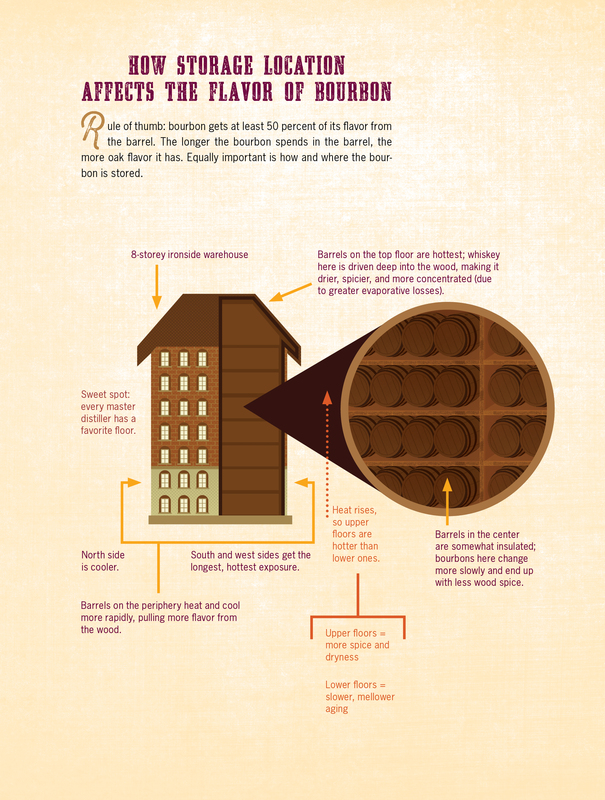 These infographics, illustrated masterfully by Andrew Heath, demonstrate these concepts concisely and thoroughly. Excerpted from Tasting Whiskey (c) Lew Bryson. Illustrations by (c) Andrew Heath. Used with permission of Storey Publishing. After describing the major styles, Bryson then provides advice on how to drink the stuff, in an enjoyable chapter on water, ice, and cocktails. Is it okay to drink your whiskey with a bit of water? Bryson tells you. On the rocks or neat? He has some answers for that as well. Cocktails? Of course! What I enjoyed about this chapter was how conversational and story-oriented it was. No recipes at all, just a description of how to make a damn good Manhattan or Old Fashioned. I’ve met Bryson in person; we were in Kentucky together earlier this year for Jimmy Russell’s anniversary celebration at Wild Turkey. He impressed me with his approachable and avuncular temperament, and that personality shines through this book. 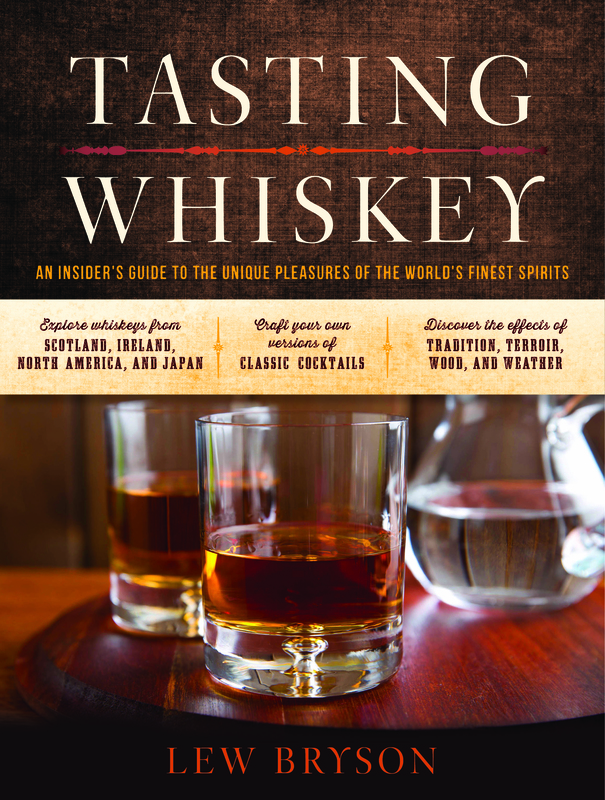 If you’re new to whiskey, and you need a friendly guide to the topic, Bryson’s book is for you. But if you’ve been around the block a few times, you’ll still find this book to be enjoyable and useful. I learned quite a bit from it. Disclaimer: I received a review copy of this book, and Lew Bryson is a personal friend of mine. Odd Drinks To Be Had. I came across an unusual article in the purpose of researching Shrubs. It ended up having no bearing whatsoever on the final manuscript, but I was fascinated enough by the piece that I OCR’d it, and cleaned up the inevitable typos. Here, from the December 26, 1893, issue of the New York Sun, is an article about the various drinking establishments of Lower Manhattan, from the Battery up to about 28th Street. Be aware, some of the ethnic attitudes expressed in this piece are very much of their time. You’ll also note peculiarities of style and spelling; those are all in the original. Man. Every time I think humankind has created every form of cocktail bitters imaginable, someone goes and proves me wrong. New bitters brands just keep coming, some with unusual flavors and others with delicious variations on classic styles. I’m working my way through the growing cornucopia of cocktail bitters, sampling the wares of upstart bitterers to let you know which bottles are worth buying. The offerings I’ve reviewed here demonstrate the creativity of today’s producers of bitters. From your traditional cherry and orange bitters to more esoteric styles such as hop and fig, here are several bottles to seek out (and a couple that are skippable). I seem to have forgotten to mention it here, but Carrie Allen of the Washington Post called me up recently to discuss the past, present, and future of shrubs. We talked a bit about the book (she enjoys it! neener neener, she’s seen it and you haven’t!) 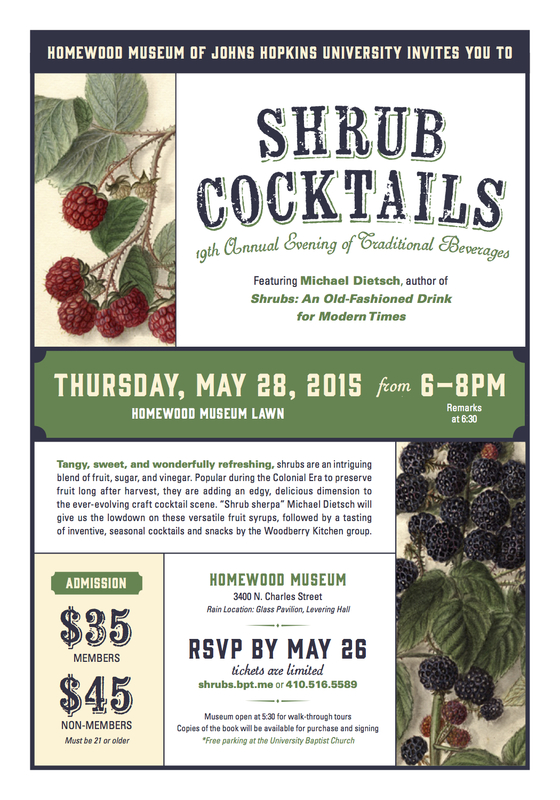 and discussed why shrubs are good to drink, either as a non-boozy treat or as a boozy one. The conversation was fun, and her piece, which ran last week, captures my voice well, so I’m really delighted with it. Check it out here!